The ancient doctor's careful account of the life of Jesus is explored in fourteen guided lessons that bear witness to the truth of who Jesus was. Luke's carefully researched account of the life of Christ is one of the finest pieces of historical writing in all of ancient literature. Yet it also accomplishes its divinely appointed-and more personal-purpose: that people of every age may know the truth of Christ and the truth of the gospel. In this new series volume, Back to the Bible's president and senior teacher deftly navigates this vibrant New Testament Gospel in fourteen lessons. Building each lesson on a passage from Luke in the ESV translation, Woodrow Kroll offers a devotional, a featured verse, and three sections for interacting with and personally applying the content. 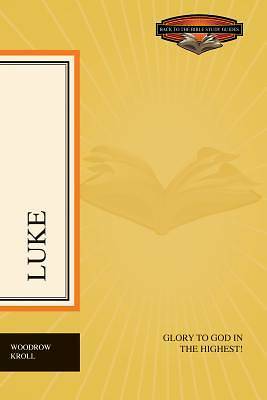 "Go Deeper" cultivates a broader understanding of Luke and how it relates to the other Gospels. "Express It" presents suggestions for turning insights from the lesson into personal prayer. And "Consider It" provides further questions for reflecting on the verses studied. Designed for personal or small-group use, this study guide will inspire Christian confidence in Jesus as the true Son of God.